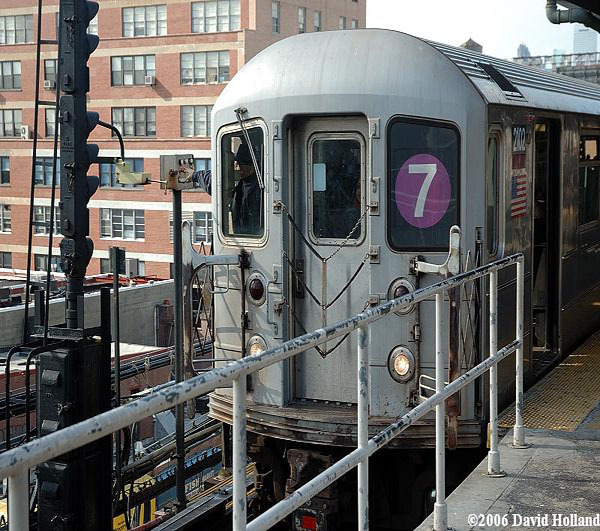 A transit project that has come up many times in this blog is the 7 Line Extension. As my readers know, I have not been a big fan of this project in terms of overall importance. The only positive aspect I saw in this project in terms of stops was the creation of one for Hells Kitchen residents. The stop which was supposed to be located at 10th Avenue & 41st Street would have been a benefit to the many straphangers who reside in the area. Transit officials dropped plans to build an additional 7 subway line station in Midtown Manhattan Thursday. Officials eliminated the plan to build a station at 10th Avenue and 41st Street when they were unable to obtain the $450 million to complete the project. Mayor Michael Bloomberg’s administration, which previously offered to fund half of the costs, said Thursday that a station is not necessary since the neighborhood is already developed. Advocates for the station do not think that is an excuse to stop construction. “Is that the only reason we build subway stations now, to spur development? How about to serve the people that are already in a neighborhood? I just don’t buy that logic at all,” said Andrew Albert of the NYC Transit Riders Council. Click here for the compete report in text & video. The westward extension of the No. 7 subway line will be built without a new station at 10th Avenue. That became even clearer this week after the city and the Metropolitan Transportation Authority let a deadline pass on a contract option for preliminary construction of the 10th Avenue station. The bottom line: in a time of budget cuts neither the city nor the authority wanted to pay for the extra station. The city is financing the rest of the work, which will bring the No. 7 line west of Times Square to Jacob K. Javits Convention Center, with a new station at 34th Street and 11th Avenue. It is an important part of Mayor Michael R. Bloomberg’s plan to spur development on the Far West Side of Midtown. Early plans called for the project to also include a station at 10th Avenue and 41st Street. But as cost estimates rose, the station became expendable in the eyes of the city — and it became increasingly clear, by last fall, that financing for the new station was unlikely. The idiocy behind this decision amazes me & that is saying something. First off, what is with the ridiculous notion that a mass transit project “has to” spur growth in designated areas? What happened to the simple concept of such project additions/extensions being built to help people already in the designated areas? If the creation or extension of mass transit infrastructure simply relies on this flawed logic, we as a nation are in deep trouble. Now lets focus on the financial idiocy behind this decision. What business sense does it make to spend millions of dollars to extend a subway line by 1 stop, especially because it is not a necessity? The answer is obvious, it makes no sense at all. The city & MTA are crying poverty which has caused delays or even temporary cancellations to important projects. Yet somehow we are supposed to believe that a better idea would be to spend money on a project where the best aspect of it has been shelved. This kind of backwards decision only benefits the fat cat real estate developers involved in the deal. It is a shame that once again the pockets of the rich are more important than the people the city & MTA serve. Thanks!